Excerpt from Potomac, MD client who trusted her house to us for a rather difficult wall project. Click on "Testimonials" page, above, for more letters. "...I appreciate the care you took with covering the wood floors, putting up plastic dust curtains, cleaning up the dust in the room afterward, and keeping my dog from going out the front door as you came and went. Everyone was pleasant and punctual and it was so easy to work with you. I would be happy to recommend you to anyone looking for a quality painting job, with great attention to detail. We look forward to working with you on our children's bathroom too..."
But ... will you come to my house for a small job? Yes! 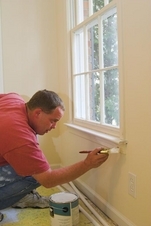 Potomac Remodeling General Contractors has an entire division of trained professionals devoted solely to Handyman Services. We are happy to come and replace a leaky faucet, patch drywall, replace rotted wood or any project you may have. There are so many beautiful products available now to homeowners planning to update their kitchen or bathroom. We are happy to help you work with our architect on a design, as well as assist in your selection of ceramic tile, appliances, fixtures, cabinetry, and countertops. We are also available for more simple remodeling projects, where the cost-conscious homeowner purchases his or her own ceramic tiles and appliances, and we install them at a "labor-only" rate. We are flexible, and eager to work with you on your personalized project. 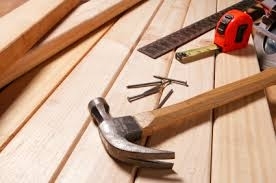 It takes time to find the right craftsman, electrician, plumber or floor specialist. We have spent many years carefully observing the work of talented professionals, and have thoughtfully selected the most skilled and reliable persons to add to our team. We know them, we know their work. In fact, we have trusted them to work on our own home. Potomac Remodeling is fortunate to have available the finest Architect, Electrician, Plumber, Wood floor installer, and Stonemason. 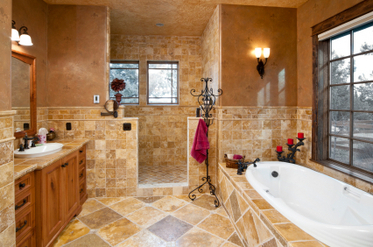 We will work closely with you as a team, collaboratively, as you achieve your remodeling vision. If your project requires an architectural drawing, electrical rewiring, wood floor refinishing or installation, plumbing, or a beautiful new stone patio & walkway leading to your house, we will provide you with only the finest talent. In the picture below, please view the floor refinishing we had done on our own living room floor.